Join us for a magnificently iIlustrated presentation by wildlife researcher Sue Morse. Mountain lions are not only being seen in eastern North America, some are attempting to recolonize their former ranges. Scientists have now documented mountain lions in a growing list of eastern states. Sue Morse has studied mountain lions in a broad diversity of habitats, from Alberta to the Arizona/Mexico border. 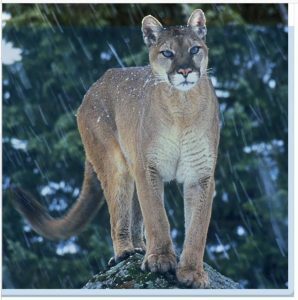 She will discuss mountain lion biology and ecology, and give us the low-down on the latest confirmations of mountain lions in the east. Get breaking news, fun events, volunteer opportunities, and more, delivered straight to your inbox. Don't forget to "like" or follow us on Facebook, Instagram or Twitter for up-to-the-minute news and alerts.